Alan Dawson was a legendary drummer and educator, known for his work with the top artists in jazz as well as for his 18-year association with Berklee College of Music. This new text and CD combination was put together by John Ramsay, a prominent drummer in his own right and a former student of Dawson's. 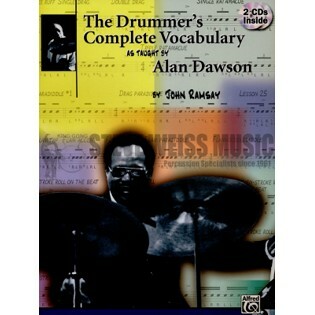 The book contains all the important techniques and concepts that Alan Dawson embraced in his own playing and subsequently taught to his students. The two CDs include some remastered audio examples from actual lessons taught by Dawson himself over the years. This is a highly comprehensive textbook from a jazz master. This publication is full of wonderful information and crosses the borders of time by sharing more of Mr. Dawson's thoughts than I ever imagined I'd be able to discover. The book not only cover history, rudiments and jazz exercises in a 70 page format, but also applies to Ted Reed's "Syncopation for the Modern Drummer." Taking numerous exercises from one book and applying them through another resource allows for a plethora of options! This was one of the best purchases I've ever made.